The village of Durfort and its craftsmen attracts lots of visitors but there are also other tourist attractions in the neighbourhood, in the Tarn as well as in other departments around like the Haute-Garonne and the Aude. Towards Sorèze: Take the old path between Durfort ans Sorèze. Go for a walk through the streets of this lovely old village with wood-framed, corbelled-construction houses and visit the Abbey there, and discover its rich history. Towards Revel and The Lauragais (The plain around Revel): After seeing the mills along the Sor, you will reach Revel. Don’t miss the market on Saturday mornings, on the square around the old belfrey. Follow the ‘rigole’ of the plain (artificial water duct, which takes the water to the Canal du Midi), you will then be in the plain of the Lauragais (formerly ‘Pays de Cocagne’). Towards St Ferréol: The Sor and the Laudot, barred by Riquet, receive the water from the Black Mountain to feed the St Ferréol reservoir, a chance to see the remarkable work achieved by engineer Pierre Paul Riquet. Towards Les Cammazes and GR7: After seeing the beech and the charcoal makers ‘pans’ in the Aiguille forest (Forest of the Needle) you will reach Les Cammazes. Then, following the ‘rigole’ (man-made water duct), along the Cammazes réservoir, you can get to the Lampy, a lake on the GR7, which gives you acces to the Haut-Languedoc path. 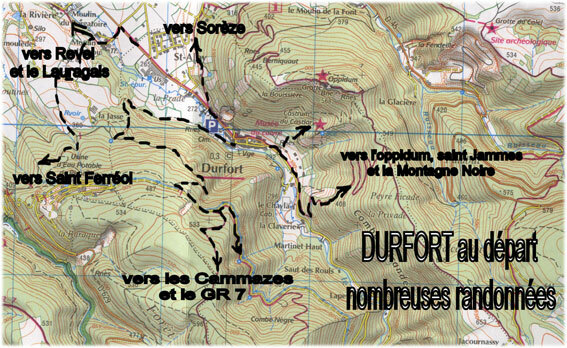 Towards the oppidum, St Jammes and the Black Mountain: After stopping at Le Castlar, the site of Durfort in the XIth and XIIth centuries, a steep but well-shaded path will take you to the top. To the left you will reach the Berniquaut oppidum where people lived from upper paleolithic times until the XIIth and XIIIth centuries. To the right you may choose to go and admire the pre-roman chapel of St Jammes near the majestic century-old beech then walk down to Sorèze through the ‘Causse du Calel’. On this ridge you are at the western end of the Black Mountain.